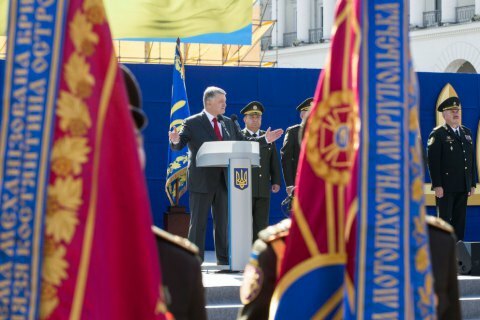 In his Independence Day speech, President Petro Poroshenko has once again stressed the importance of receiving the Tomos of Autocephaly of the Ukrainian Orthodox Church for Ukraine. "There cannot be a free body, when the soul is in captivity. Let us be heard today in Constantinople, Moscow and the Vatican. We are determined to put an end to the unnatural and non-canonical dependence on the Russian church of a significant part of our Orthodox community. A church, which sanctifies Putin's hybrid war against Ukraine, prays day and night for the Russian government and for the Russian army," he said. The president recalled that Baptism came to Ukraine from the Constantinople Mother Church, and was spread all over Eastern Europe from Kyiv. "Ukrainian Christianity has more than a thousand-year history, its own theological, liturgical and ecclesiastical tradition. Now that we have restored and defended the state independence of Ukraine with the capital in Kyiv, there is no reason why there should not be the Autocephalous Orthodox Church of Ukraine equal to the other Autocephalous Orthodox Churches," he said. According to him, the issue of the Tomos on Autocephaly of the Orthodox Church of Ukraine goes far beyond religion. "It is similar to the strengthening of the army, protection of the language, struggle for membership in the European Union and NATO. This is another strategic benchmark in our historic way. This is a significant component of our independence," the president concluded.